I will stop my app building and not renew my contract with Apple. You who have my apps can of course continue using them, but it will be impossible to buy them from Appstore/Itunes from now. When I started to play with the thought of making apps with different tutorials, my first thought was - It will be to small to view in the iPhone screen. After making some tests, I realised that it's not the case at all. It is really easy to get the information as well as what is shown on pictures. Even making perspective tutorials for iPhone screen worked perfect. I decided to give the idea a try, and now it's actually live and online. This is a free App with info about my other Apps on the App Store. Birch - Oak and Mahogany imitations. Here you get all information to make beautiful wood imitations. I really hope you enjoy and it increase your wood graining skills. 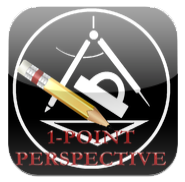 In addition this app will have a section with pictures of different panels with tromp moldings and ornaments. Most of you can draw a room in a 1- point perspective. That's a piece of cake, you say, - and it is. A square, four lines to a point and a couple of lines for the walls and cieling - that's it.. OK - it's a room, and in perspective. That kind of sketch is not very useful. 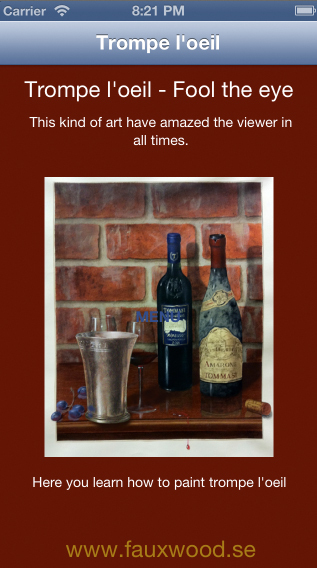 In addition you have a couple of animations showing the drawing "live"
My latest App - Grisaille. This one will have Tutorials for both moldings and ornamentation. It will also include some nice Grisaille panels. There will be a photo function so you can create your own grisaille album. I would love to have your opinion about the apps and how they can be improved. Please take a moment to rate them at App Store. FAUX WOOD are made for iPhone and iPad. My apps are made for iPhone (Faux Wood are constructed for both iPhone -Pad and Pod). The reason is that the iPad have the enlarging function which make that you still can see all apps in full screen on all iPads. In other words, all my Apps work perfect both on iPhones and iPads. with tutorials how to paint Glass - Bottles - Brass - Tin- among other things. I really would appreciate if you take the time and rate them on AppStore. Grisaille ( from French gris = gray) is painting in gray tones. There is tutorials for both moldings and ornament. As a decorative artisans we quite often use the grisailles for different kind of fillings, moldings and ornaments. This kind of paintings are really trompe lóeil- it fools the eyes of the viewer.